Whenever a new social media platform or feature comes out, businesses are skeptical & are slow to jump on-board potential new trends. I understand why… it is hard to take risks when you are company that has a lot at stake. However, the other argument is that it can be a risk not to try out new trends before they become the new norm. 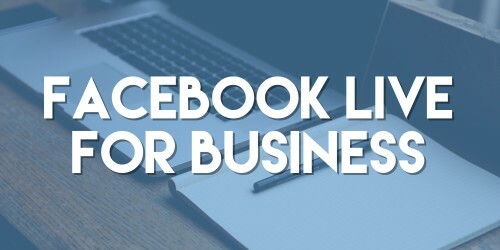 Facebook Live is now available on personal pages, business pages, & even groups. If you are unsure about how to do Facebook Live there are many tutorials for that around the web, but in this post I want to discuss what you should cover when you broadcast via Facebook Live. Now is your opportunity to show all of the hard work that goes into running your business, & your audience will love having the opportunity to learn more about you & your business in a very real way. If you are a photographer, you can virtually take people on a photoshoot with you. Show them how you set up your scene & what you look for in a great picture. If you create products, you can take people on a tour of your manufacturing facility. This can increase trust if they can see where their products are being made. If you own a restaurant, you can take people into the kitchen & let them watch the chef cook a meal. Let their mouths water! Your employees work hard & deserve some extra recognition. Plus, your clients love getting to know the people behind the company. Create a set of questions & do a weekly series where you interview a different employee each week. Let your employees takeover Facebook Live & broadcast out whatever their job entails. Share success stories for services that you’ve provided. Walk through case studies that you have done for a client. There are frequently asked questions & common concerns from customers in any business, & it can be a really great strategy to address those things head-on. Facebook Live gives you the opportunity to have a real conversation & be genuine with your audience. Address FAQs & take questions live. Talk about some common concerns & put minds at ease. Facebook Live provides a great opportunity for businesses to showcase their expertise. You know the ins & outs of your industry, but it is likely that your audience does not! If you own a bar, teach people how to mix a decent drink. If you sell software, teach people how to use it. If you teach courses, teach people a segment from something in your course. The opportunities for Facebook Live are really endless, & I encourage you to get creative with it! Entertain & engage with your audience – they will appreciate it.